I have been in Waco for three days and I am having a blast. I am also exhausted but in a good way. 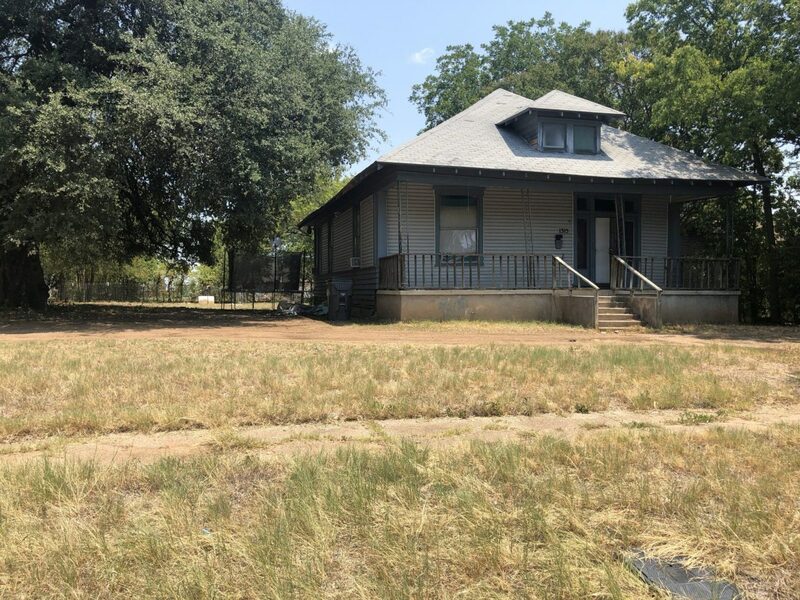 We have purchased a fixer upper home in Waco, Texas. We are not moving. Instead, I am going to remodel the home, furnish it and rent it on Airbnb. I have been really nervous about the home because I hadn’t actually seen the inside. I know, it sounds dumb, but I did see the outside. And I “kind of” saw the inside via face time with my realtor. 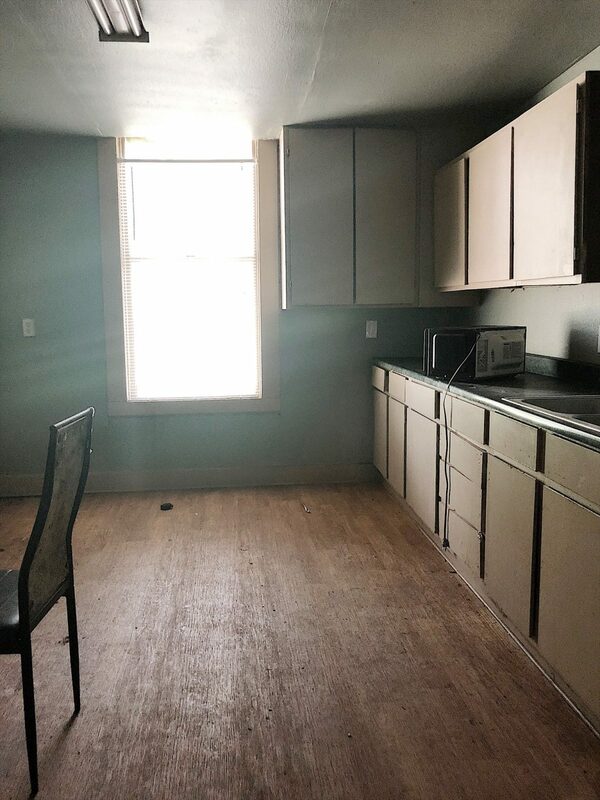 So I have been really worried that I would hate the home or that it would have some horrible flaw or that I wouldn’t be able to fix it up. 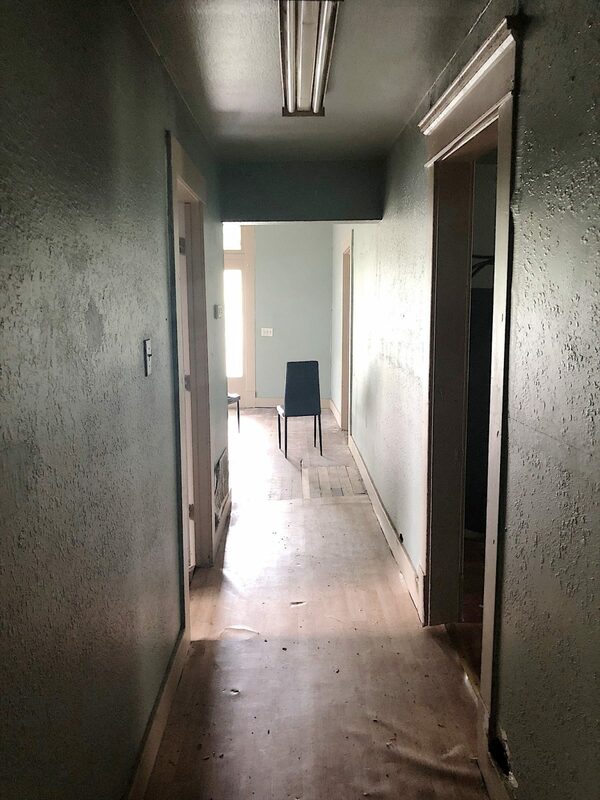 For those of you that saw my instastories and saw the house with me for the first time, you will know that it all worked out ok. Don’t get me wrong, the house is in shambles. 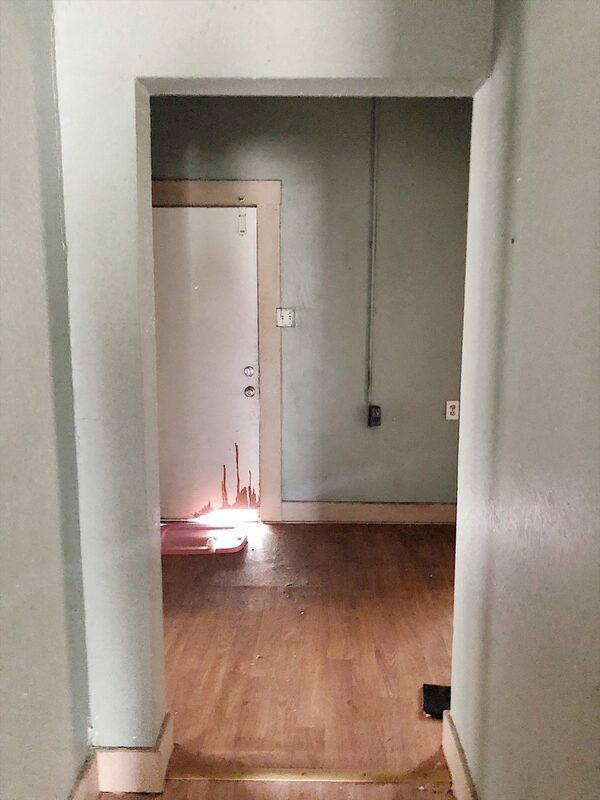 It has a terrible odor, holes in the walls and very little charm. But it has potential. And that’s all that matters. The lot is the best part of this home. The house is about 1200 square feet and it sits on half an acre. Technically it is two lots and if we wanted we could build another house on the left side of the property. Plus, there is this oak tree on the left side that is heavenly. It provides the most beautiful area for entertaining and will make a wonderful focal point. And that’s why I want to build a wrap around porch on the home, so that I can orientate the focus of the house from the front to the side. The yard goes all the way back to the wooden fence on the back right. Which is wonderful. Except when I think about a landscaping budget. Yikes! And if you are curious, I already found someone to take the trampoline and the kids toys that were left out front. Let’s talk about the home. I already knew it needed repairs in the foundation and new electrical, plumbing and roof. 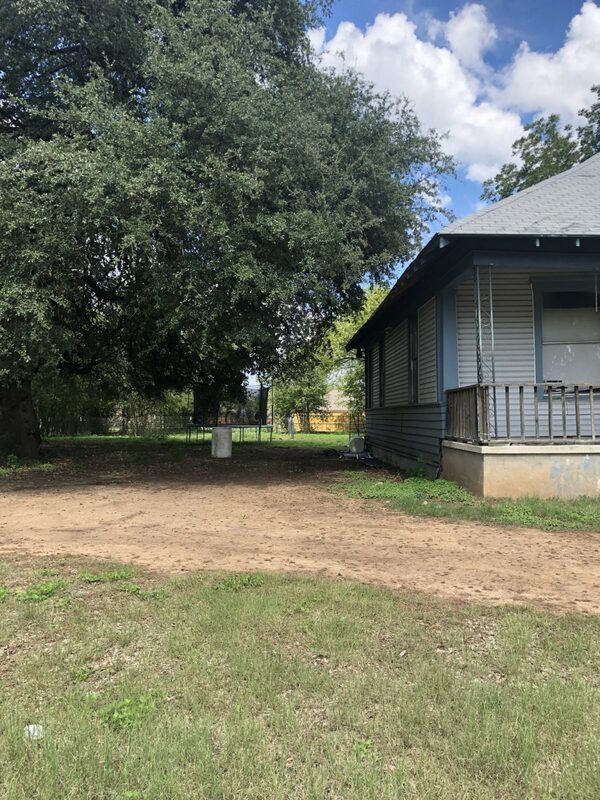 The front porch needs to be pulled off (the concrete and the roof). And most of the inside of the house needs to be gutted. I know you are wondering if there are any good things about the house. As you can see below, the hardwood floors are likely salvageable. The ceilings are over ten feet and there is a chance we can remove the ceilings all the way up to the rafters. The windows are great but need to be replaced. I was difficult when we realized that a family had been living in the home until Friday. Especially when we realized the condition of the home. It was not habitable in my opinion. It was kind of heart breaking. There were a lot of mice living in the home. Eeek. I wasn’t sure how they got in the home until I saw the back door. Are you kidding me? 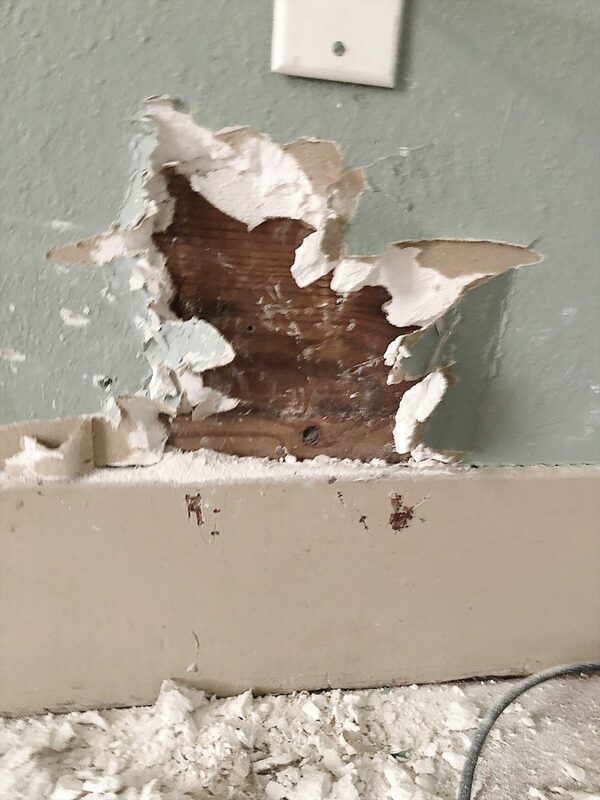 The best news was when my son Matt discovered shiplap under the plaster walls. Now that was wonderful. We also went to the Silos and Magnolia Market. 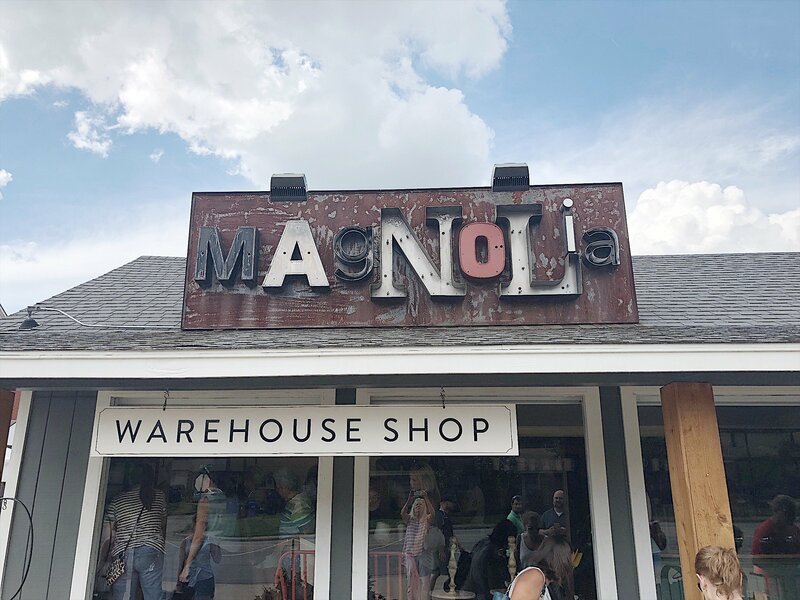 For the first time, we went to Magnolia on Bosque. This is a warehouse store for items from the Magnolia Market. Everything was 75% off and if you had a receipt from Magnolia Market, you got an additional 10% off. Eighty-five percent off is amazing!!! It’s only open on Thursday, Friday and Saturday but I will be sure to visit every time I am in Waco. A friend of mine sent me this photo from the Ojai Valley Inn. 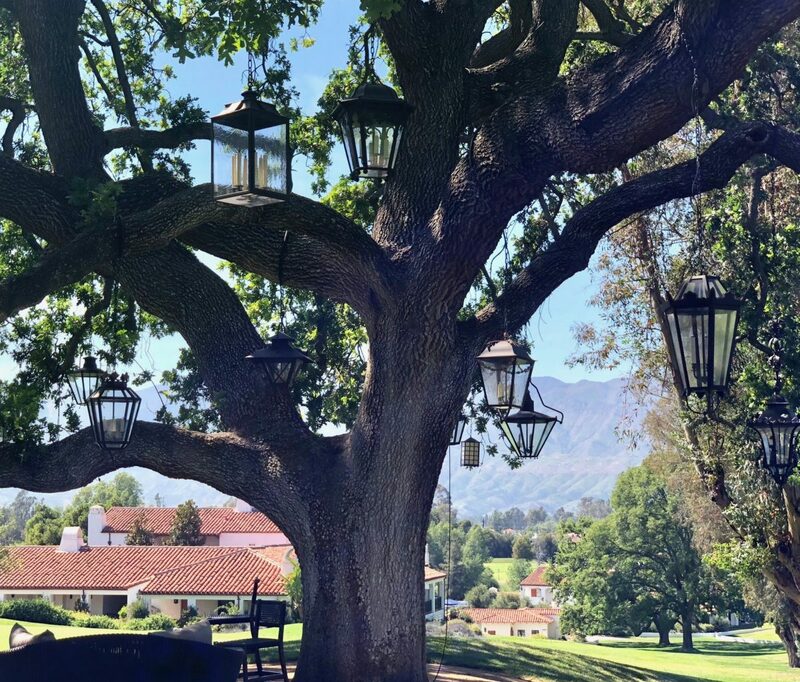 It’s the famous oak tree at the resort and just look at how they added lanterns in the tree! I just can’t wait to finish the home and show our oak tree some love! The next step is to find a contractor and get this project started! So much potential! I’ll be watching your magic come to life! I can’t wait to see you work your magic! 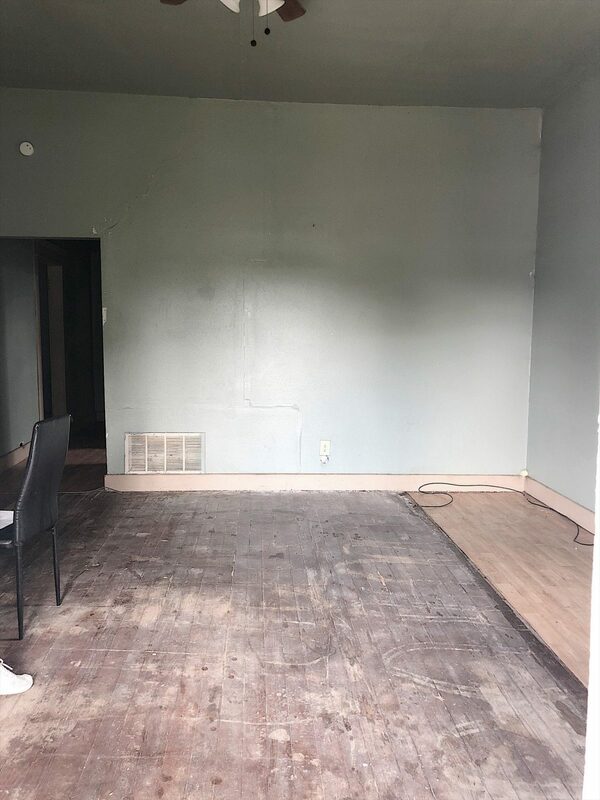 I can’t wait to see the house transformed! I’m really curious to learn about your process. Did you have a realtor looking for potential houses because I don’t recall seeing this particular house in the MLS? 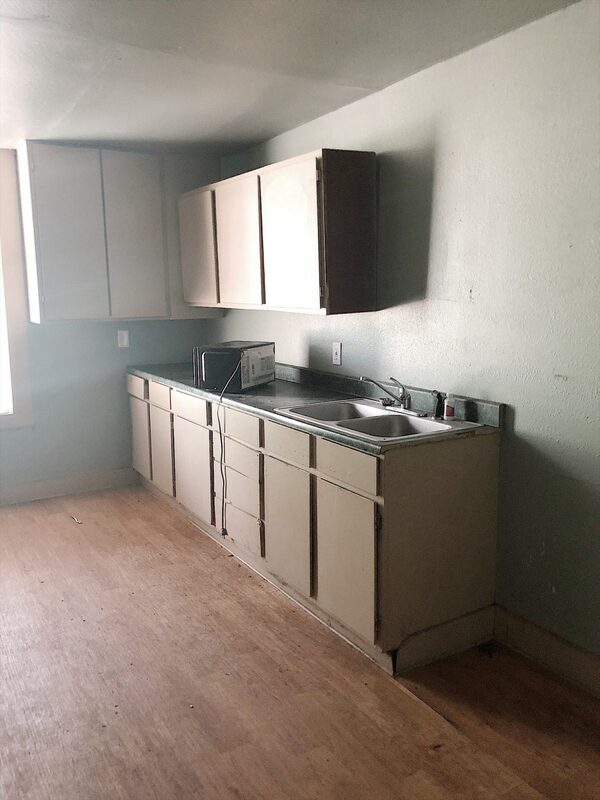 (I was doing a little house hunting myself!). Love this Leslie! Have fun! 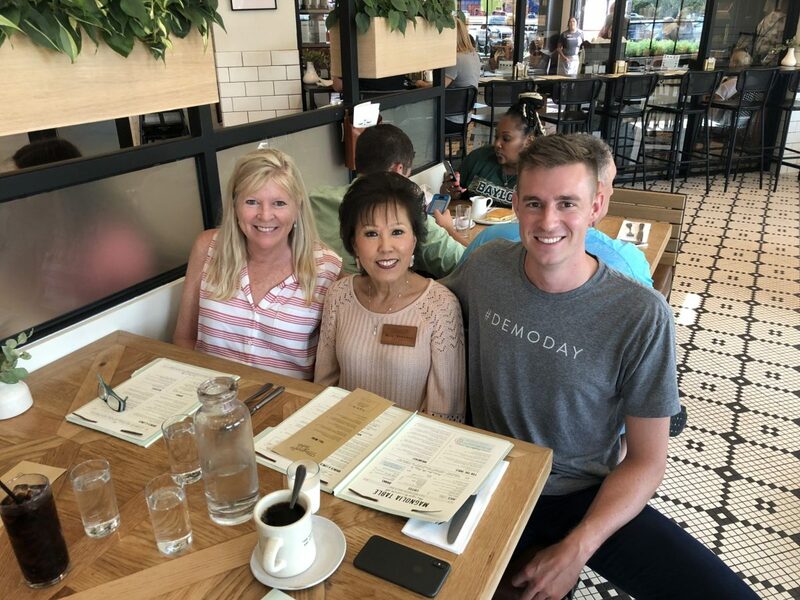 I am so excited for you and thrilled that we get to follow along! How fun. I too feel for that family with children. I hope they have found a better home to live in. Can’t wait to see all you do with it!!!! And so it begins. Nice to read you appreciate the live oak tree on the lot. They’re highly valued here. Please invest in a local arborist so any trimming that might be needed will be done at the right time of year and in the right way. That way the possibility of Oak Wilt can be minimized. Again, welcome to Waco! What a fun renovation adventure! The house has lovely bones and good appeal from the street. I am certain you will be able to make it fabulous. I LOVE rescuing homes and have done 9 so far! Good luck! Heading to Ojai this weekend – will have to find this oak tree! My husband and I drove to Waco from WI during the 1st week in September (I felt I needed a vehicle to haul my purchases home!). We did everything Magnolia and more! Lots of fun and I’ll say all food everywhere was delicious and fresh! Accidentally, hit the Magnolia Warehouse while it was open! I’ll put a plug in for Waco Tours as well! We learned a lot about the area, the Waco of today and the history! We took the Classic tour AND the River Cruise tour – both superior! We were also good enough detectives to locate the house boat fixer upper and much more! Best of luck with the remodel, having just returned I can see the draw to Waco and am anxious to follow your story!